The SP PNG Hunters were tested in a physical match but managed to pull off a 20-18 win over the Tweed Heads Seagulls on their new Home Ground at the National Football Stadium tonight. About 13, 000 spectators at the National Football Stadium were on the edge of their seats as Tweed Heads led 18-14 with 15 minutes of play remaining for the first time in the match. 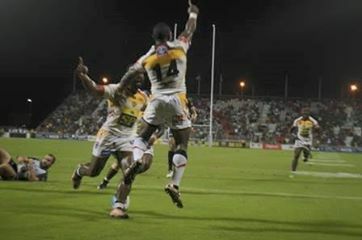 Ate Bina Wabo threw a dummy and stepped around tired Tweed Heads defenders 10metres away from the try line to score in the 71st minute with Co-captain Noel Zeming adding the extra 2 points that hit the uprights and luckily went in as Hunters defended their hearts out in the dying minutes to seal the win. The win was not exciting and impressive for Coach Michael Marum but he said at least they got the two points. Marum highlighted that there were so many handling errors in the game and the defence was not on par allowing Tweed Heads to score some very easy tries. However the coach gave credit to the young players who have really stepped up again in this match complimenting their performance for the past two rounds. Tweed Heads Seagulls Coach Aaron Zimmerle said they knew playing against the SP PNG Hunters at home will be tough but he was happy with his team’s performance which they really improved from last week’s performance. He said the 20-18 final score line brings a lot of positive out of the team especially against a top side like the Hunters. The other try scorers for SP Hunters are Watson Boas (25th minute) and Edward Goma (31st minute) while Zeming was perfect with his boots converting a penalty kick and three conversions kicks.